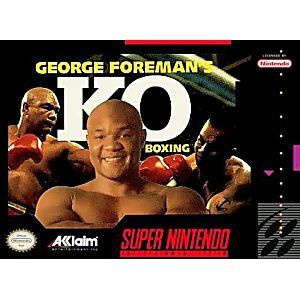 George Foreman's KO Boxing SNES Super Nintendo Game Cartridge Cleaned Tested and Guaranteed to Work! 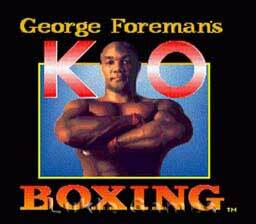 You're "Big George" Foreman and you've got an appetite for BIG action that only KO BOXING can satisfy. Take on a roster of 15 heavyweight contenders as you go for the World Championship. Rook your opponents with stinging left-right combos! Pound your way to the title with a spectacular "Big George" Super Punch - while the computer "judge" tracks the action! 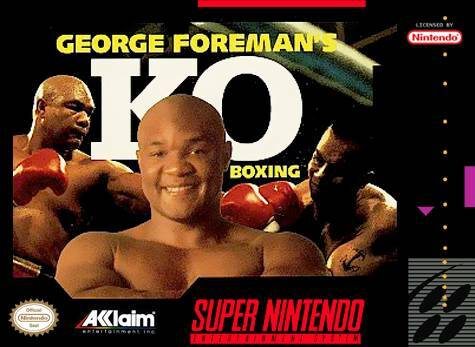 GEORGE FOREMAN'S KO BOXING puts the power of the greatest knockout artist in your hands! I normally don't write reviews of games but I will on this game because I want to encourage all out there to steer clear of this game, WAY CLEAR!!!! It is one of the most difficult and unrewarding as well as discouraging games I have EVER PLAYED!!! I am a fan of boxing games but if this was the only boxing game I could play then I would just give it up completely. IT is way too hard to be any fun. You have to be a gaming champion to even beat your very first opponent. Definitely one of the worst games I have ever played. I was very disappointed. In my opinion you still cant beat Mike Tyson's Punch Out on the NES. A classic that still is fun even to this day!!! !